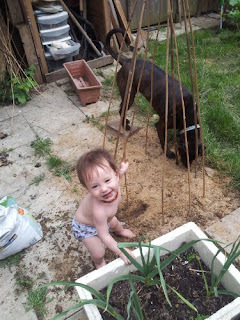 Guest poster Juliet Kemp of Twisting Vines shares her tips for gardening with a toddler. My son is 15 months old, and he's been out in the garden or allotment with me since he was a few weeks old. Now he's both mobile and super-inquisitive, however, it's a different kettle of beans from when he was a baby I could put down on a blanket; or put up on my back without constant demands for MAMA DOWN MAMA. Here are my top five tips for managing your food garden with your toddler. Firstly, and most importantly, take a deep breath, and do your best to chill out. There's two main issues here: the tendency of some children to eat handfuls of dirt, and the tendency of almost all children to pull up plants, dig around in the earth, and create a terrible mess. With the first one, every time I turn round to catch Leon with sand or soil around his mouth, I take a deep breath and remind myself about the proverbial peck of dirt. Anyway, a little grub is good for the immune system. Then, when you're trying not to freak out about them wrecking your garden, remember the long view. If they have fun now (and making a mess is irresistible fun for most toddlers), they're busy building positive memories of the garden. Keep that up, and in a couple of years you might just have a willing helper. Yell now, and they'll be skulking inside in future. Not only that, but messy play is hugely valuable for children's development, and what's better messy play than grubbing around in the earth and examining plants? It's easier to chill out and let them have if you're confident that they can't hurt themselves. In a food garden there shouldn't be many poisonous plants, but some medicinal herbs might need to be moved well out of reach (or given up altogether for a while), and if you have flowers, check that they too are safe. Here's a couple of useful lists: California Garden Web poisonous plants list; UK Royal Horticultural Society list; UK Real Gardeners list. Many of the plants in there will grow in other temperate zones (not just California or the UK), but you might also want to check for a list for your local area. A more likely risk is that you have bamboo canes around. If they're anywhere near toddler height, either put caps on them, or get rid of them for now (caps at toddler height can also be pulled off, unfortunately). You might normally use short pea-sticks for your peas, but maybe for a couple of years you'll be better off using a bean wigwam setup, even if it is far too tall, or finding another way of supporting them such as growing them by a fence or next to sweetcorn if the timing works out. Most of us gardeners have the odd plant that isn't robust, but is very precious to us. Sit down and have a good hard think about what you really care about, but which isn't robust enough to be yanked around. Then take steps to protect it. A fence? Moving the pot well out of the way? If you've identified what you can't stand to lose, by definition anything else is replaceable, which can help you maintain your inner zen calm when you turn round to see half a bed of plants ripped up. And the nice thing about food gardening is that hey, maybe this is an opportunity to make today Rocket Salad Day, or Baby Carrots Day. This is a bit age-dependent, but even Leon at 15 months can "help" given a little bit (OK, a lot) of encouragement. Filling holes or pots with earth or sprinkling seeds can be great fun, but far and away the best job has to be watering. A child-sized watering can means either "help" with the watering, or a deeply occupied toddler watering everything else they can get the watering can to. It doesn't have to be a bed of their own, if they're too small to make use of it. For example, I've put a 'sensory play' area on our balcony to keep Leon busy while I'm out there, pottering with the plants or just having a sit down with a mug of tea. It has a small polystyrene tub, with some stones and scoops, which I can fill with water; a pot of earth (which, of course, goes nicely with the water to generate mud); and a pot of mint which he loves yanking at, smelling, and eating. Mint's tough, and I have plenty of mint elsewhere anyway. I've also got a pot of thyme and dill seedlings ready to move in for more sensory experiences. Once he's walking independently this summer, I plan to clear a half-bed for him in the back garden, get him some child-sized tools, and get him to plant a few seeds with me. Then encourage him to 'garden' in his own bed. This year I expect that just to be another excuse for messy play, but next year and the year after it'll already be "his" space to experiment with. If your kids are anything like old enough to "copy Mama/Daddy", then a small bed of their own is well worth the space given up to it. Gardening with kids can be great fun, and it's a fabulous opportunity for them to really get hands-on and find out where food comes from. Grab the chance to get them happy and involved now; and the equally valuable opportunity to practice that parenting zen calm in the face of occasional adversity. Juliet Kemp lives in London, UK, with her partners, baby Leon, and dog Sidney. She works from home as a freelance writer, and balances that with parenting, gardening, crafting, and a great many other things that catch her interest. She blogs at Twisting Vines about making things and growing things, and is passionate about sustainability, environmental issues, and respectful parenting. Fabulous advice! I have shied away from starting a garden b/c I have small children (also b/c I know nothing about gardening), but this is just wonderful advice -- about chilling if plants get pulled up and love the sensory area idea. Wonderful even without a garden.